"In these electric age , we wear all mankind as our skin". McLuhan's most useful insight in the context of cybermedia is that technologies provide extensions and specializations of our physiological and organic potentialities. This observation is specially relevant to electronic technologies which he considered to be different expressions and extensions of our central nervous system: "By putting our physical bodies inside our extended nervous systems, by means of electric media, we set up a dynamic by which all previous technologies that are mere extensions of hands and feet and teeth and bodily heat-controls- all such extensions of our bodies, including cities- will be translated into information systems". Specifically, this extension, or "outering", or externalization of our central nervous system takes the form of networks which are more or less faithful imitations, or technological metaphors which attempt to reproduce the intricate networking of our own body electric. mankind to a closer understanding of each other: we are in fact, and not only in theory, in a global relationship of minute pressures, stimulations and variations of intervals between people and things , which make the global human sensibility approach the condition of the global variables. Within this technological environment, the practice of communications provide software networks which fill the airwaves to capacity. We harvest and market every available frequency from the very low range of human hearing (30 Hertz to 20 Kh ) to the extremely high speed of 300 gigahertz for satellite and radar communications. The common denominator of our software networks is the human languages, the world's first and still foremost "mass media>". We milk our grammars and their attendant vocabularies, and the infinite variations afforded by them for innovation, control and processing. Within the unified electronic environment , language provides the essential differentiation factor without which there cannot be articulation nor processing. Just as the electronic hardware is the necessary technical metaphor for carrying out our increasingly complex operational activities, language, the human software, provides the articulated extensions of the human mind. We find in the whole world's electricity / language interactions, the same bewildering, but perfectly understandable relationships that govern the mysterious brain / mind interactions. 3. The Electronic Sensory Extensions. "intelligence", artificial or otherwise, without including considerations for the role of the senses. possibilities of the human sensorium. Better than anyone else, the artist knows that electricity has something to do with touch. 4. The Place of Consciousness. reconstitute outside our body the kind of "interiority" which is characteristic of human consciousness. Our conventionally "western" understanding of consciousness is that it is an "internal"
culture. From the earliest beginnings of alphabetisation, the Ancient Greek Pre-Socratic and Socratic philosophers began to propose the idea that the seal of cognition and even perception was not, as previously believed, the chest and the lungs, but the brain. Even as they were being increasingly alphabetized, the Greeks, and the subsequent western civilization, shifted their sensibility from the realm of breathing to that of thinking. Of course, there could be no clear-cut distinction between "inside" and "outside" in pre-literate cultures who based their epistemology on breathing because breathing is essentially an inside/outside experience. It is, based on an unconscious appreciation for the specific relationship between the reader and the text, that Plato and Aristotle, and much later Kant and Descartes, formulated a categorical distinction between the objective reality of Nature (physis) and the subjective experience of consciousness. The literate bias of this distinction has escaped completely the attention, both of the philosophers of the past, and the cognitive psychologists of the present. Reading is a process whereby an objective array of abstract signs, a code , is process whereby an objective array of abstract signs, a code, is translated by the mind into a subjective experience of interpretation. And yet, in spite of trillions of words said and written about information-processing and consciousness since the time of the Presocratics, no one seems to have made a significant observation: it is that turning reading material into cognitive material requires the combination and the articulation not only of words and ideas, but also of sensory information. You cannot read a novel, you cannot read at all without a minimal input of imaging. That imaging process is built upon sensorial reminiscences which are stored in memory and made available on demand for endless combinations and recombinations which make up consciousness. Under the impact of the literate bias, Nature itself became a book, a metaphor which ruled the thinking of the Middle Ages and still remains an unquestioned assumption in many modern societies. Within that literate frame of mind, consciousness was possible only within our mind. The division between reality outside and consciousness inside was clear, made all the clearer by the efforts of scientists to corner every aspect of the material, visible world into neat and proper and universally agreed-upon definitions. As McLuhan suggests: "Our very word 'grasp' or 'apprehension' points to the process of getting at one thing through another, of handling and sensing many facets at a time through more than one sense at a time. It begins to be evident that 'touch' is not skin but the interplay of the senses, and 'keeping in touch' or 'getting in touch' is a matter of a fruitful meeting of the senses, of sight translated into sound and sound into movement, and taste and smell. The 'common sense' was for many centuries hold to be the peculiar human power of translating one kind of experience of one sense into all the senses, and presenting the result continuously as a unified image to the mind. In fact, this image of a unified ratio among the senses was long held to be the mark of our ratio-nality, and may in the computer age easily become so again. For it is now possible to program ratios among the senses that approach the condition of consciousness ". Very quickly, while the Renaissance was developing our humanistic tradition, the common sense elaborated by late Latin and medieval philosophy became equated with the printed word. Indeed, text provide meaning and henceforth "sense" which is common to any reader. Much in the way that the alphabet reduced all our sensory experience to a single line of meaning, digitalization is now reducing all our organic and mental experience to a single sequence of coded information. But the critical difference between books and today's cybermedia is that the latter make possible the retranslation of this common code outside the realm of the human mind and sensorium. 6. The Vanishing Boundary Lines of Consciousness. Because we can today project the sensory interplay which is required for consciousness outside the closed universe of our minds, our convenient distinctions between objectivity and subjectivity have ceased to be entirely reliable: the boundary line is blurred when it is not-eliminated altogether. Taking, for example, as a point of entry into this matter of boundaries, our relationship to mental and technological screens, we can find a guiding pattern into the maze of our mediated information-processing. Needless to say, with books, the "screen" where images and meaning are played out, is inside. In fact, it is more like an internal stage than a flat screen, hence the close association that has existed between alphabetic literacy and theatre. The Greek invention of the theatrical institution was but a standardizing model for the integration of sensory inputs coming from within the self during the reading process. With television, the ultimate refinement in a long series of spectacular strategies of information-processing, the screen is both outside an replete with sensory information. However, from the point-of-view of information-processing, TV is an incomplete technology. It pours its images from the outside in, totally impervious to our individual responses. Many critics have pointed out that TV is a one-way communication medium. It offers nothing better than a "packaged" reality. Even so, it is TV's very high sensorial content that makes it so attractive and provides the necessary step toward the later outering of consciousness. TV also rapes the boundaries of the private imagination. computers we are masters or slaves, or a bit of both. Are the routines of programming purely external events pertaining to an objective machine, or do they impose such a rigorous protocol of operations that they turn into mere extensions of the program?. The only possible answer to that vexing question is to recognize that computers have created a new kind of intermediate cognition, a bridge of continuous interaction, a sort of "corpus callosum" of exchanges between the outside world and our inner selves. The development of this intermediate stage of conscious processing is verified not only in terms of our personal relationship to computers, but also in the sociodynamics of computers within the network environment. A rapid synergy can establish itself instantly between computers and television in marketing and electioneering polls, or even at the stock exchange where important life decisions are being taken for us by machines with minimal intervention of our own voting or thinking abilities. 7. Penetrating into the Screen for Objective Collective Consciousness. outside our own body. Still more, this artificial consciousness can be shared, and the sharing possibility confers upon V.R. the principal character of conventional, objective reality. entire lives into the spiritual form of information seem to make of the entire globe, and of the human family, a single consciousness?". established by removing the last boundary which is the interface. This is not necessarily desirable, but the prospect should not obscure the fact that we have been entertaining determinative relationships with our machines and our inventions all along. There is no such thing and there has never been such thing as "natural man". That being said, when we are confronted with the obligation to adapt to our own inventions, we tend to adopt the standard strategy of cowering into our previous image. Even as we are witnessing the relentless takeover of our minds and bodies by bionic technologies, we are far from trying to measure up to the requirements of a bionic psychology. We still hang on to an outdated, if not irrelevant image of the Renaissance Man trapped within the perspectivist point-of-view of the closed private consciousness. As McLuhan quipped, adopting a single point of view in front of even as banal an electronic environment as broadcast TV is tantamount to flapping one's arms very fast to stop a tidal wave. Today's man and woman must try to grow psychologically to the size of our technological reach. If we can walk, albeit virtually, in Miranda'a valleys, we must begin to realize that our consciousness private and collective, all at once, has taken the proportions of our solar system. We must also strive to integrate within our intimacy, that is within our sense of self, the intricacies of the universes opened up to us by our technological probes. Even as our personal and individual fields of vision are being hugely extended by our probing and retrieving systems, the limits of our normative scope are being exploded never to return to their former shape. We cannot pretend anymore that "all the world that the eye can see" is our only reference point for identity and choice. 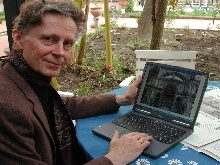 Derrick de Kerckhove is director at the McLuhan Programm in Culture and Technology at the University of Toronto. He has published extensively in the field of communications theory. His work involves neuro-cultural research investigations into the impact of the media such as writing, television and computers on the human nervous system. Text originally published in ArtFutura's 1998 catalog.